I'm a manufacturing engineer, and in the 8 short years that I've been in the field, I've seen most of the country's large-scale manufacturing operations go to Mexico, China, or another low-cost region. Because of this, I'm especially excited to go on large factory tours to see that quality manufacturing can exist in America and support the local communities. Winnebago in Forest City, Iowa did not disappoint. We arrived for the first tour of the day and were already preceded by about 15 senior citizens. We signed in for our tour and looked around the small museum of Winnebago history. They even had a couple early Winnebagos open for display. 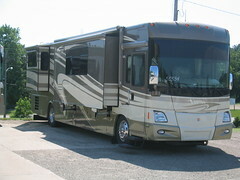 Seemed like pretty nice RV's to me (of course, I'm the type of girl who usually sleeps in a tent). I had no idea what I was in store for in the modern Winnebago fleet. We boarded 2 buses to head on a tour of the plant. Winnebago consists of a large campus of buildings. 60 acres of it are under rooves. In addition to the driving tour, we made two stops to watch operations. The first was where floors were placed and secured on the chassis as well as any electrical work in the floor and finishing such as linoleum or carpeting. Multiple lines of chassis awaited assembly. At the right moment, an overhead conveyer system would transport the correct components to the awaiting chassis. Line workers waited for them to drop from the ceiling and then went to work with the assembly. Yes, we had to wear safety glasses. At the second stop, we got to watch some of the finish work, assembly of the slide-out panels, installation of antennae and other systems on the roof. We could also see custom cabinet components flying on the overhead conveyer system headed to their proper RV's. 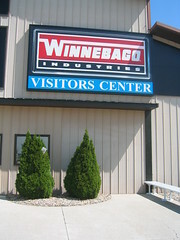 Winnebago is unique in that it fabricates the majority of its components right on site. They mold plastic for water and holding tanks. They extrude metal components. They have custom cabinet makers and finish workers. There are very few manufacturing operations in the U.S. that can claim that level of manufacture. After riding the buses around for a while and looking at rows and rows of finished vehicles (20,000 RV's are made in the factory annually and are all sold before they're built. 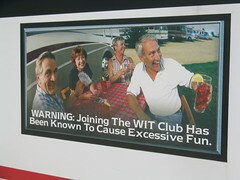 Winnebago's are only sold at dealerships, not at the factory), we were back at the visitor center. About 8 Winnebagos were open for viewing in the parking lot. Unbeknownst to us, they were in retail price order and we entered the "cheapest" one first. Gone was the groovy naughahide finishwork of the old RV's in the museum. Enter granite countertops, travertine tile, stainless steel appliances, flat panel TV's, and Sleep Number queen size beds. The last one we stopped in was the Holy Grail. Retailing at $309,000, it had 3 flat panel TV's, double entrances to the bathroom with a separate shower stall, granite and marble finishes everywhere and all the "usual" luxury car extras like a back-up camera and a GPS unit. Yes folks. . . Mobile housing that cost more than my house. The manufacturing facility, fun RV tours, and kooky senior citizens make the Winnebago factory my hands-down favorite tour in Iowa.